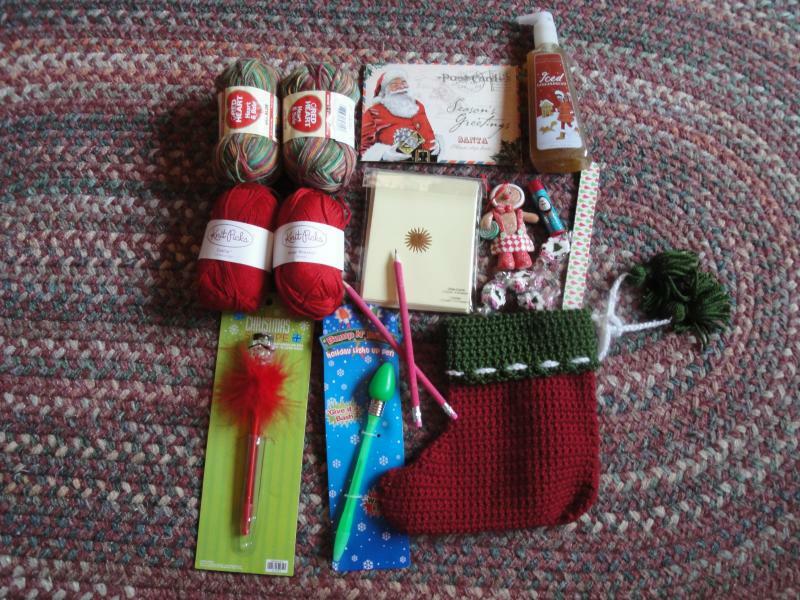 Oh my gosh, I received my package from Teresa (got here earlier than we thought, hope the one I sent is early too), I am amazed at what she sent me!!! 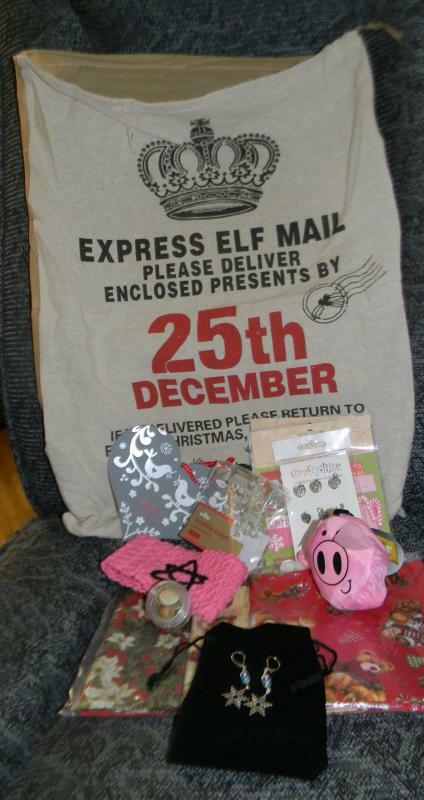 I am feeling very spoiled Will get pictures up tonight (after work), I JUST LOVE IT!!!! 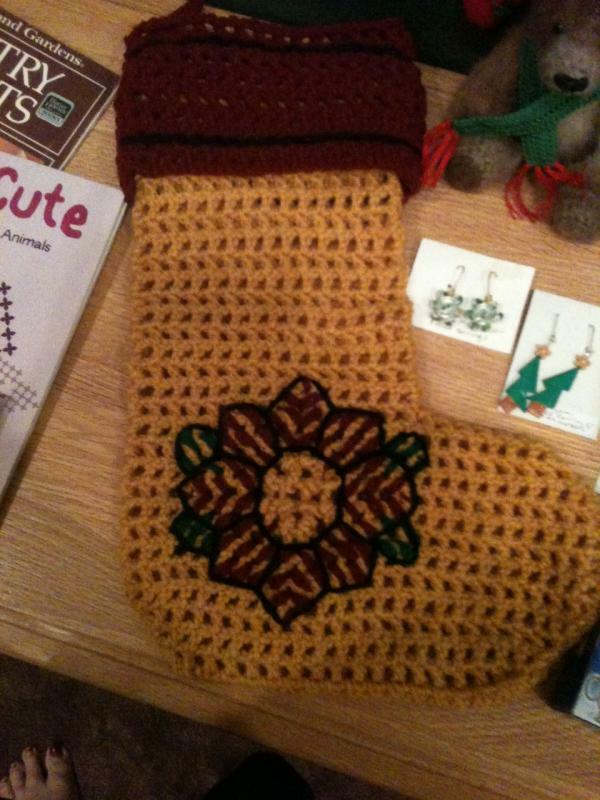 Look at that adorable stocking! I love the variegated yarn. 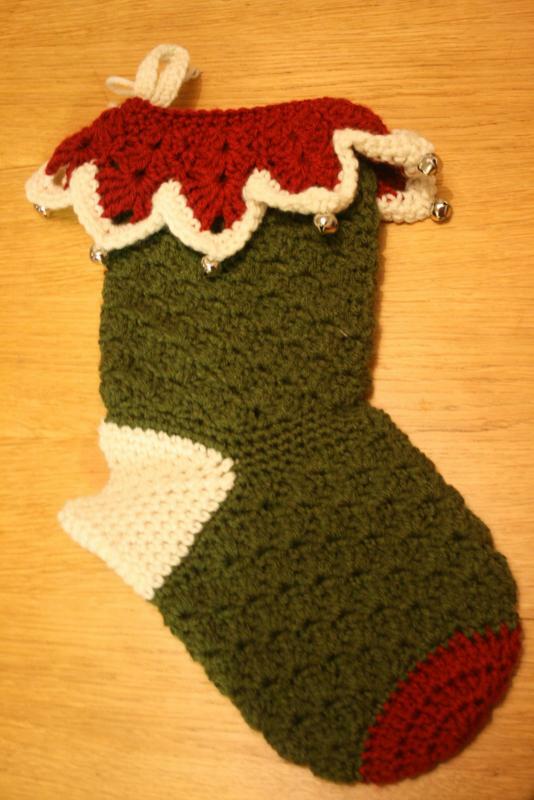 Smokeyp81, what yarn did you use for Kidge's stocking? And that Paton's Lace--it's one of my favorites--I've made a stole and shawl out of it. In fact, I have some purple waiting for the perfect project. The owl is adorable. Or should I say 'adorbs?' I just learned that last night on those funny Sprint commercials. Here are the pics of my package from #1Crochetfan. I love everything and absolutely adore the bear , and the little mouse, so cute!! (Purcy like it too). Teresa does beautiful work, I can't believe she made all these things, and scored some great freebies. 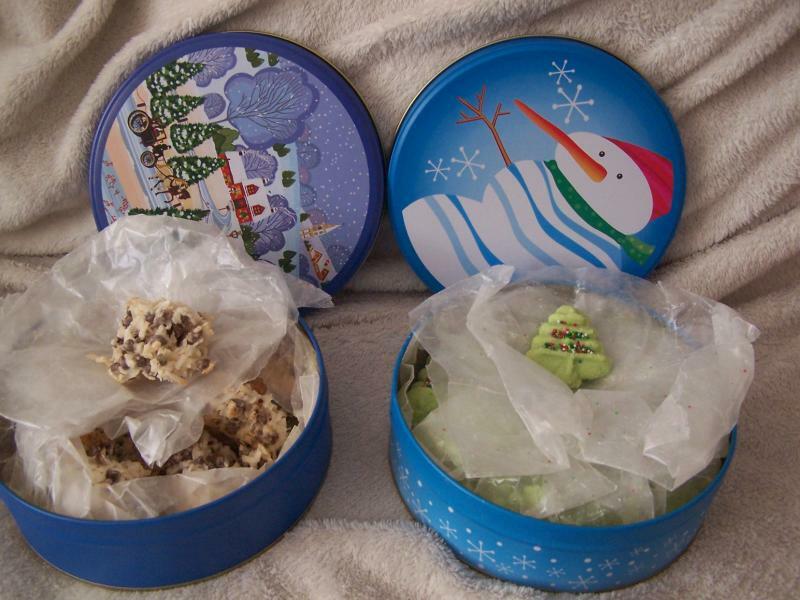 The cookies are yummy too (we did a little cookie swap). Thank you so much Teresa, I have enjoyed having you as a partner!!! I'm glad you received everything okay with nothing damaged, and really enjoyed having you as a swap partner! 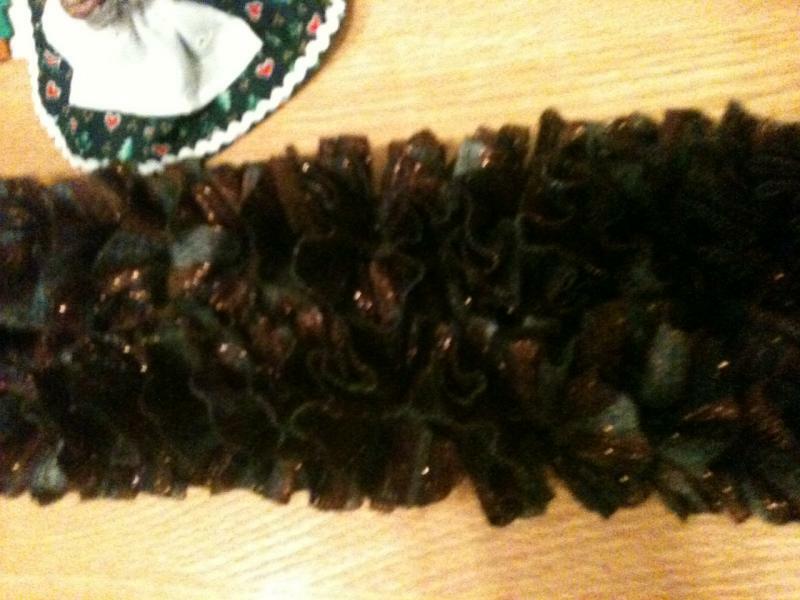 The yarn is Hobby Lobby's I Love this Yarn overdyed in Caitlyn. I's so glad you liked the knitted stocking....it is just a plain pattern, but the yarn really makes it! 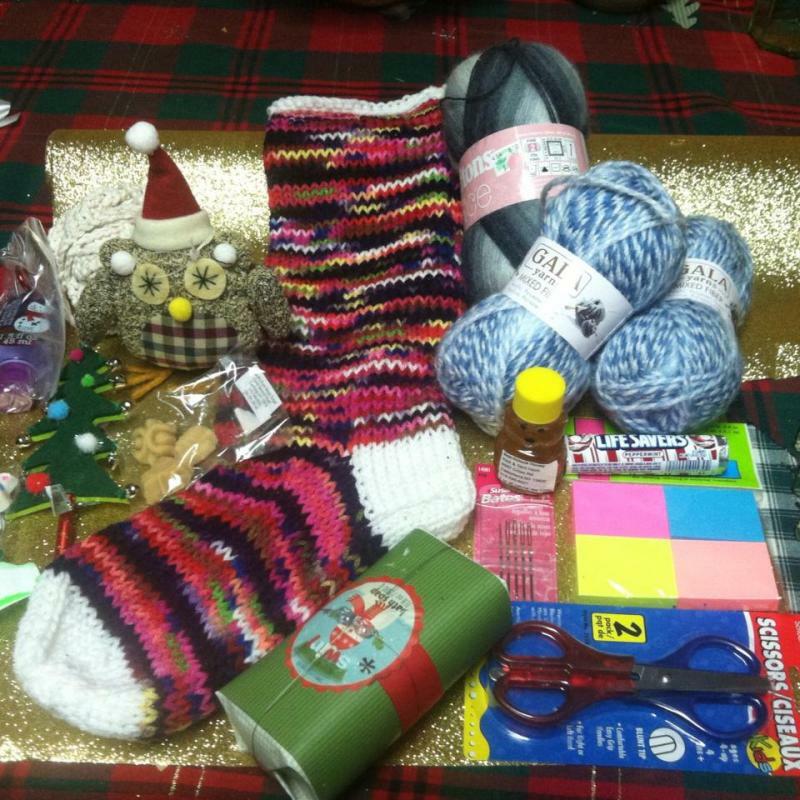 Wow, Teresa, you stretched that $10 limit so far it must have almost snapped! Lucky Becky! 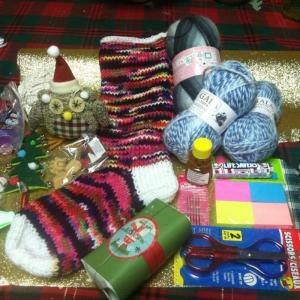 :)Oh I love your packages, Kidge and Smokeyp81! I can't wait until mail comes to hopefully get mine, today! I love Kidge's adorable little 'fat' stocking--it looks like a Christmas boot. Love it! YAY!!! Teresa package has been delivered, now the wait to see if she likes it. I looooove it! It's hanging from my staircase right now! 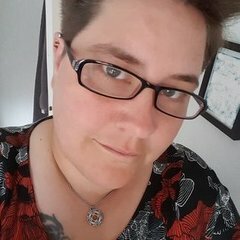 Beckyb- YAY!!! 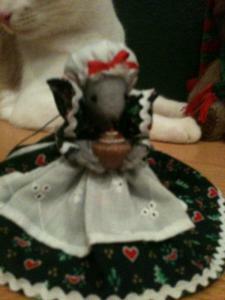 Teresa package has been delivered, now the wait to see if she likes it. I really thought for sure it would come on Saturday, no matter that it was snowing but I finally got it. 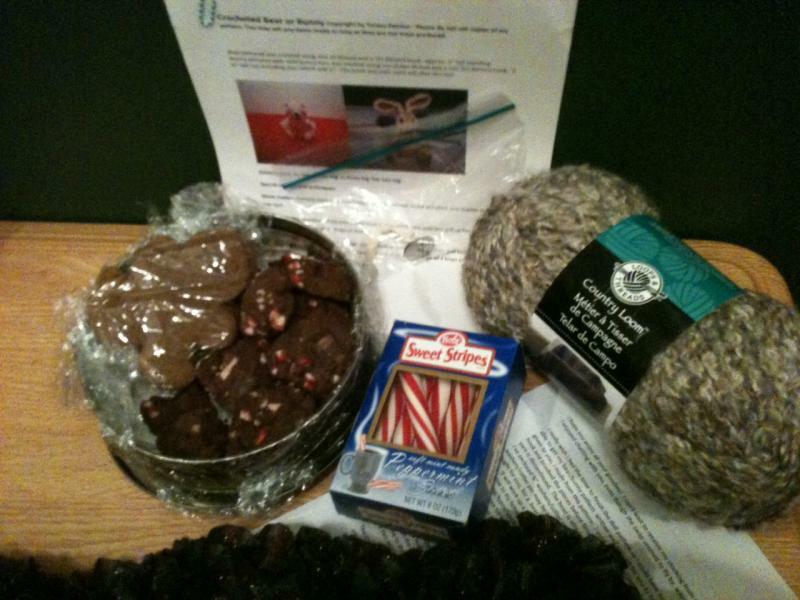 Thank you, Becky, for such a wonderful package! I absolutely love all my goodies! You are an amazing crocheter and an amazing baker. The cookies are delicious, btw. 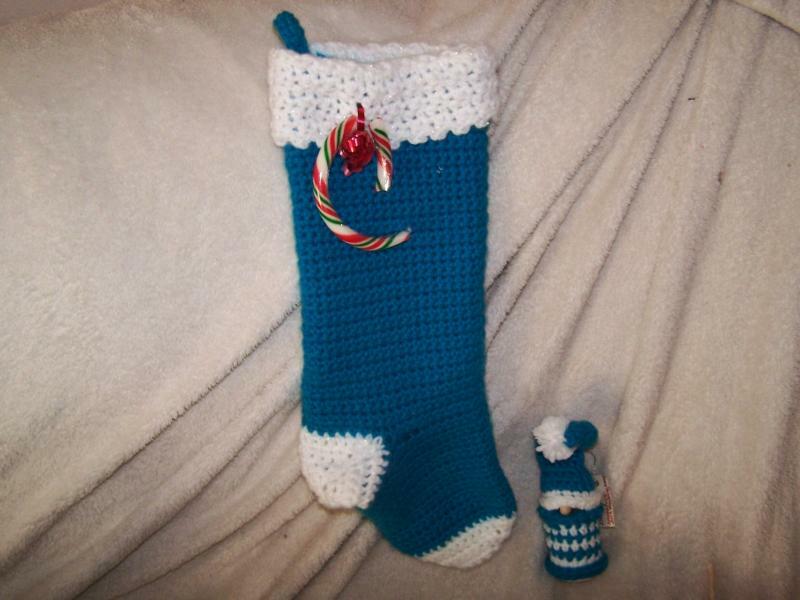 -She crocheted me a beautiful stocking in my favorite color, blue, that also matches an adorable gnome ornament. 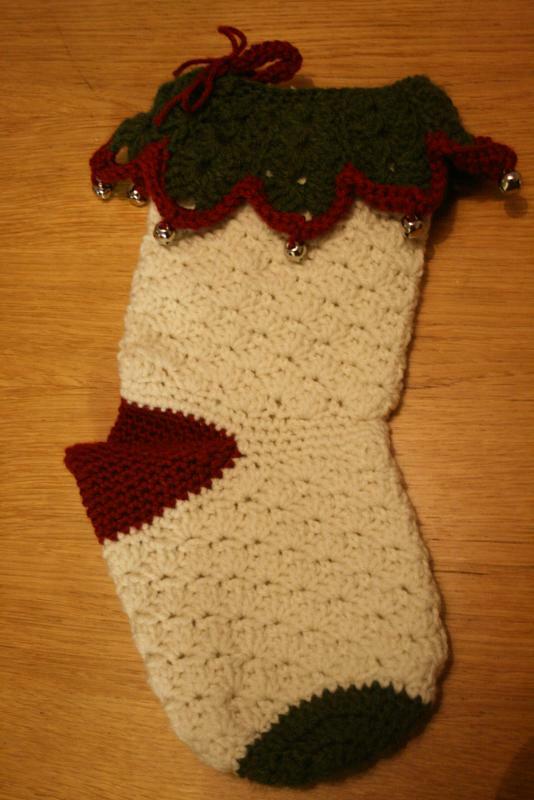 She used white yarn with glitter for the trim of the stocking which is so pretty! She attached a candy cane to the stocking which I have already started to eat. 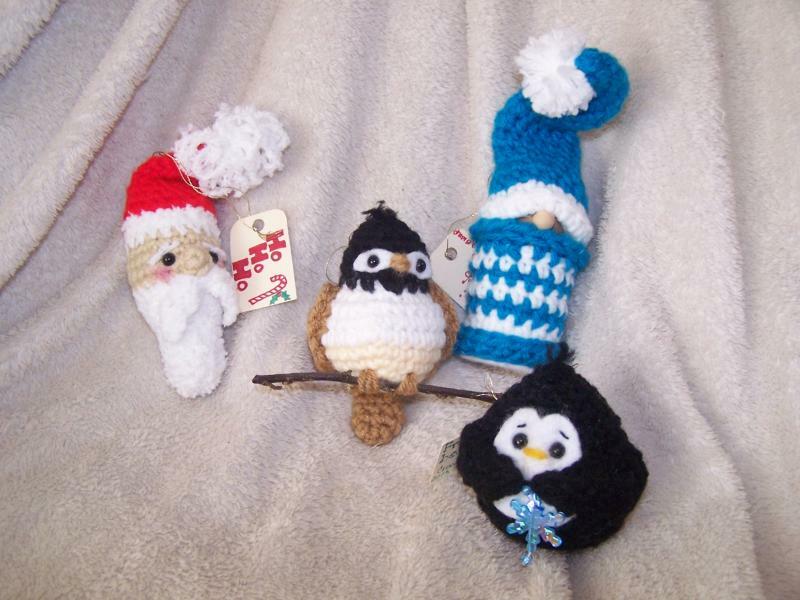 -She crocheted me the most adorable santa, chickadee and penguin ornaments. They are all hanging on my tree, including the cute gnome. -She crocheted me an adorable snowman bag along with a snowman kitchen towel. I love the kitchen dishcloths she made me in a christmas colored variegated yarn. 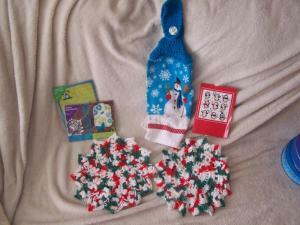 -She included peach yarn, crocheted labels, candy canes, stationery and a tin of coconut macaroons and a tin of butter cookies. 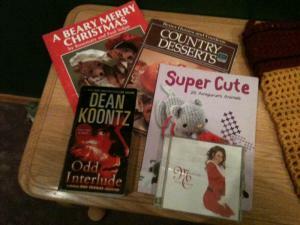 She also included the recipes for the yummy cookies and more recipes in a wonderful Christmas card. Of course, I love everything, Beckyb . Thank you so much! 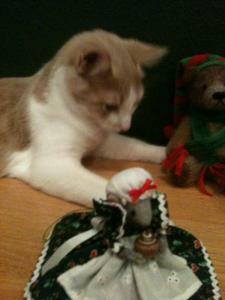 Hey Beckyb, would you like to swap cats? Rex wants to visit Purcy, I think. I'm so glad you liked everything!!! Once I started crocheting I just couldn't stop, lol. 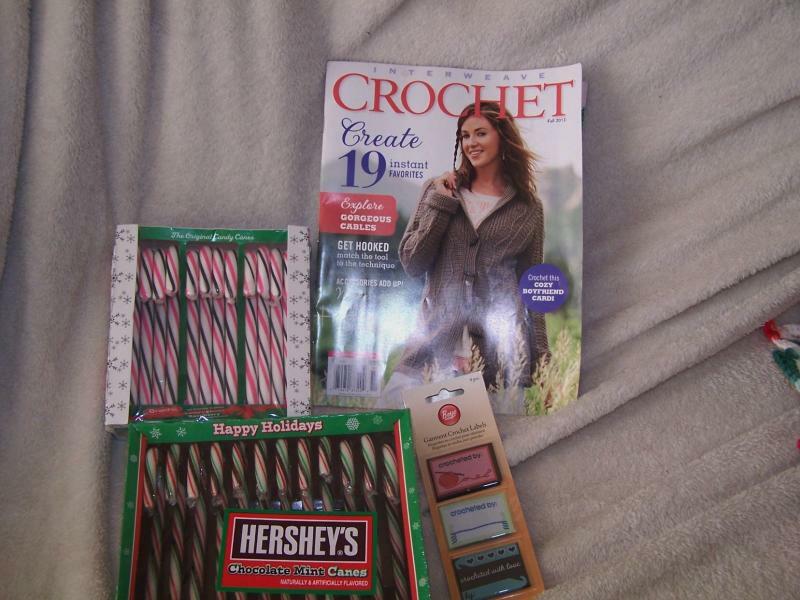 (and that magazine was definately one of my "duh" moments back in september had bought it at Joann's and then bought the same one at Walmart, on the same day Glad someone could use it ). 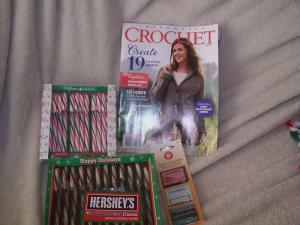 Only thing I bought was the candy (and pattern). 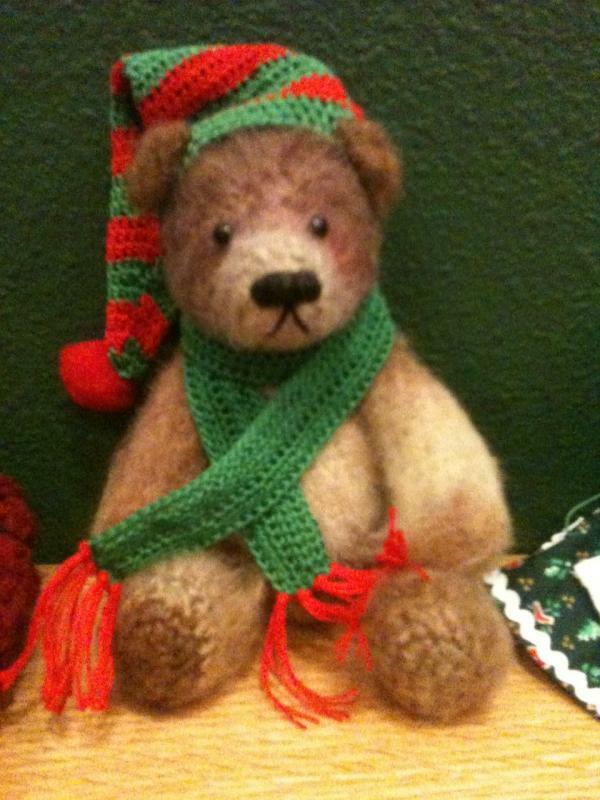 I think Rex needs a fur coat though if he wants to come visit,lol ( he is cute)!! I promise, I participated! I was soooooo ridiculously busy with everything that I completely forgot to keep checked in here on the thread. 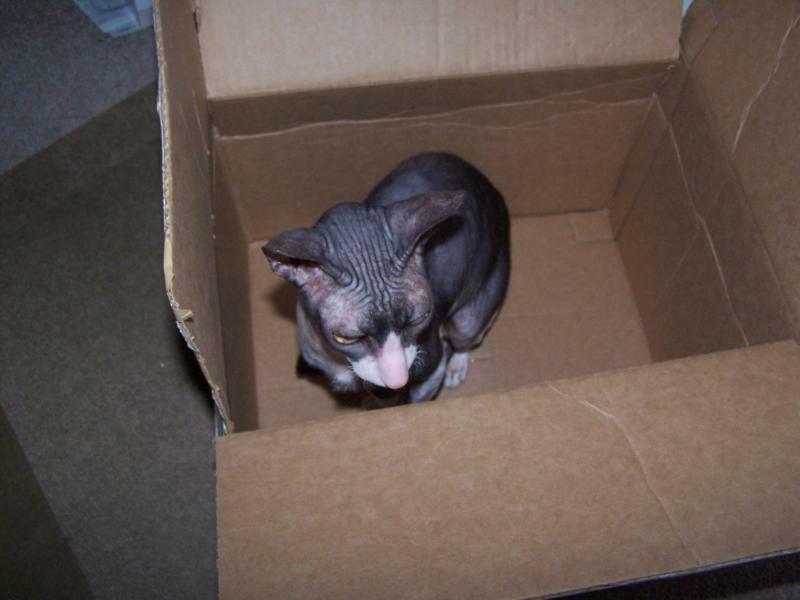 But Skoggy's package went out the other day and I am anxiously awaiting her to receive it .... . There are lots of goodies in there, so many that I was afraid the box wouldn't shut! I went a little different route this time than usual, I made more than I bought which rarely happens! LOL I spent a total of $9.54, just under the budget! Sadly, mailing is a teensy bit on the expensive side so I am super glad I planned ahead for that part. 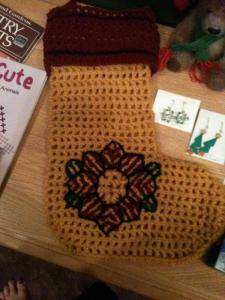 I love the stockings thus far! You ladies are so talented! Well done, Tiffany! 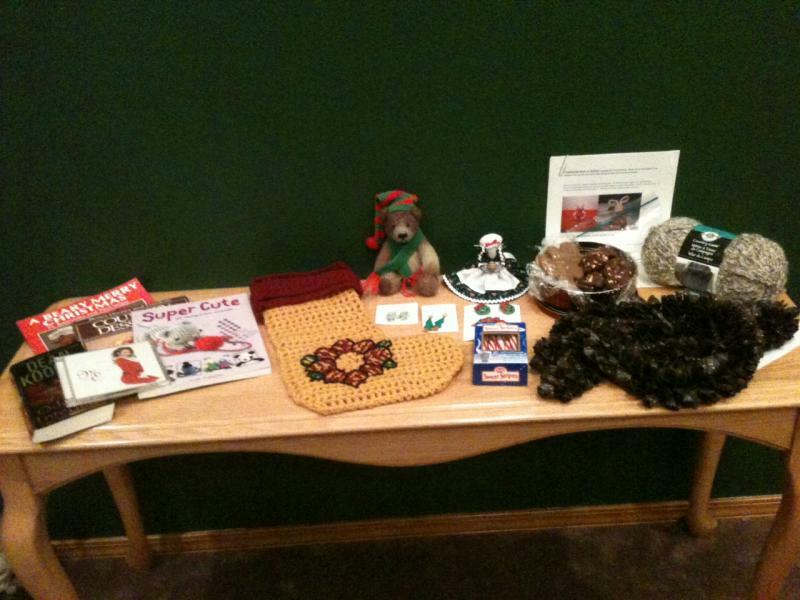 Our thrifty sides can't wait now to see what you sent to Skoggy. No snow for us, of course, but a chance for winter rain on Saturday, which would be very welcome. We ridiculously set a new record high on Tuesday of 83 degrees, which is about 15 degrees or so higher than our average for mid-December. Yesterday was 79, one degree off the record. But the Pacific storm coming in is going to drop our temps 20 degrees, so it will finally start to feel like the holidays around here. I received my package from Tiffany today! Wow oh wow! 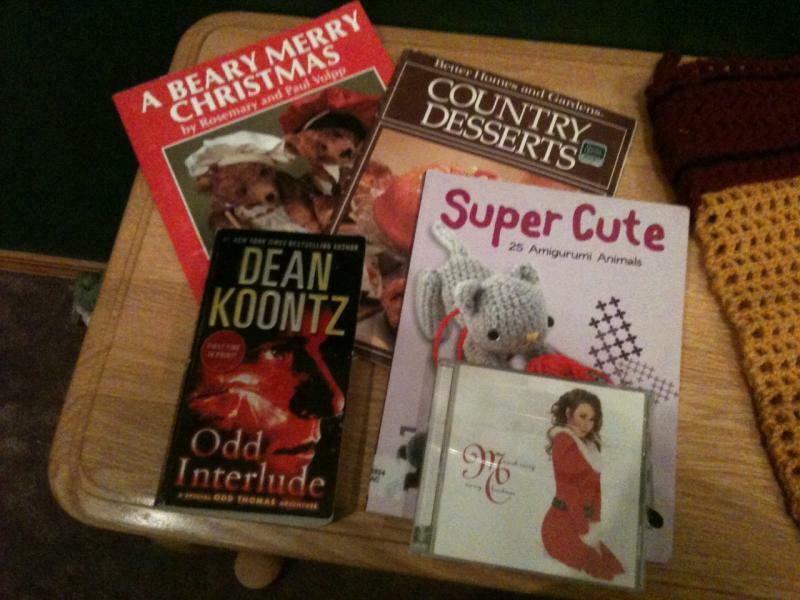 I have been truely spoilt! I will get photos taken (will take a while) and post pics asap. Its a fantastic package and I love it all! Thank you so much, my friend! Hmm... seems I haven't posted pics yet. I thought I had. I will sort that out tomorrow! I just also want to add that Tiffany did receive mine in the end. OH my, thank you for the reminder Emma! All wrapped up! Simply gorgeous paper btw, I almost couldn't stand to open it! 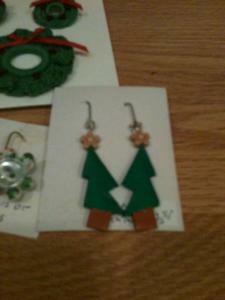 A gorgeous wooden ornament that matched the paper (and also my crazy color scheme for the tree/deco! 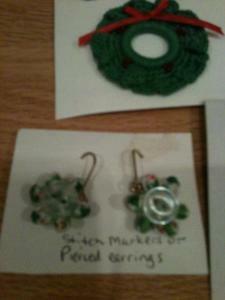 Snowflake earrings Ms. Emma made herself for me in a beautiful black velvet bag! 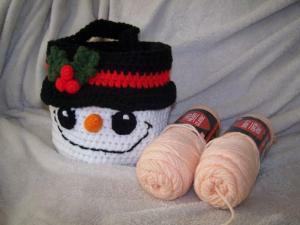 A bead and button bracelet kit in a tiny container - so cute! Some beautiful holiday fabrics... oooh I can't wait to make goodies with them! 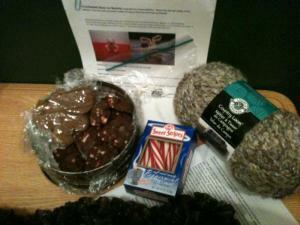 Thank you so kindly my dear for my wonderful package! I am actually rather glad it arrived after the holidays because on that particular day I needed a pick-me-up and it was perfect! Completely changed me out of my funky mood and motivated me to smile & appreciate all of the good things in life. I loved being your partner & hope that this year brings you happiness & our continued friendship! 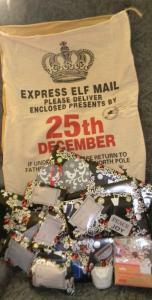 Here are some pics of the lovely handmade things that Tiffany made for my swap parcel. A lovely mug cozy as well as the mug. 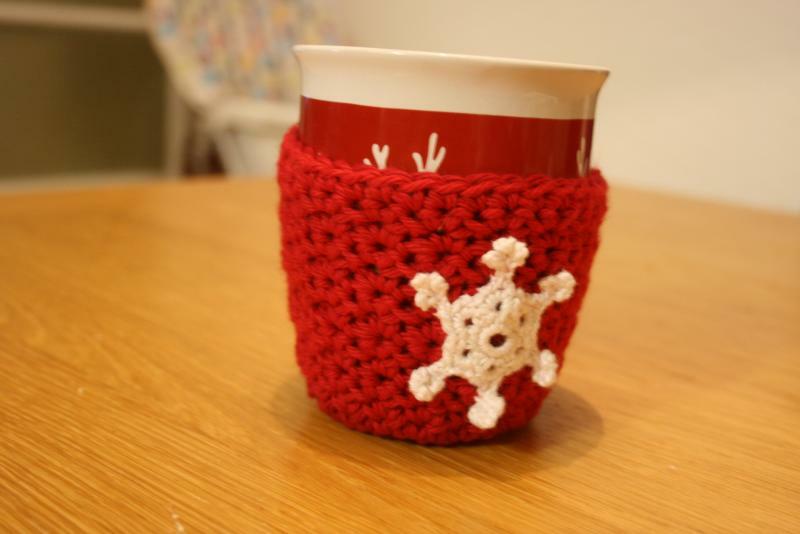 There was also a lovely mug for Patric. 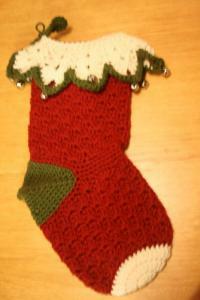 Next are 3 absolutely amazing stockings! I really really really love them! 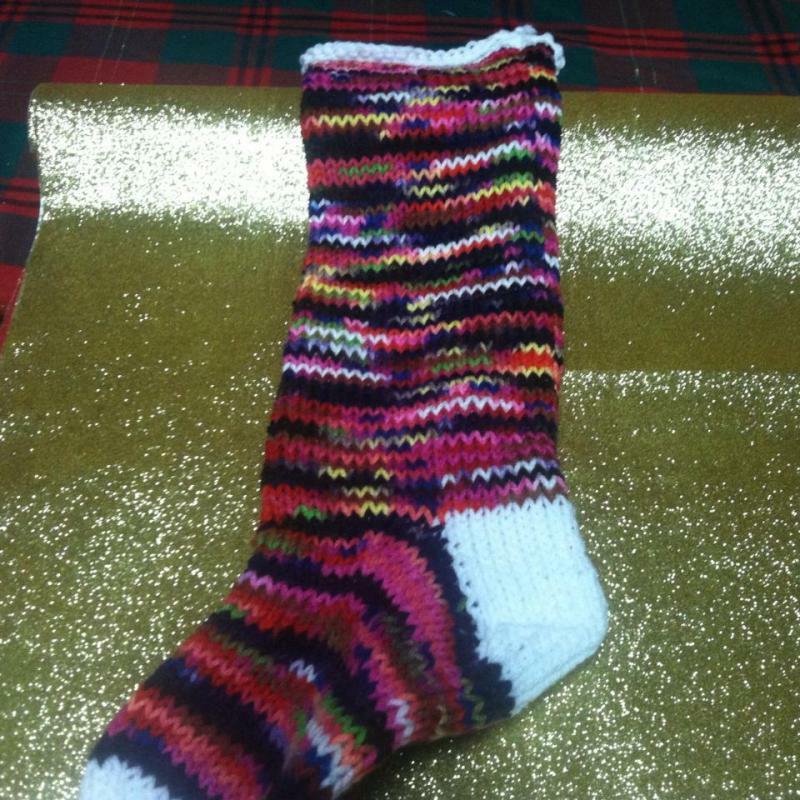 A lovely and soft pair of socks Tiffany made. 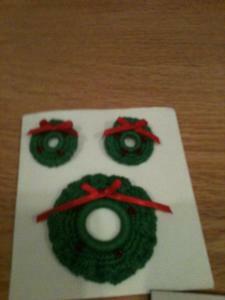 There was also a crocheted mini wreath for my tree and a mini red and white stocking. I've probably missed somethings off but there was so many! I love it all so much! 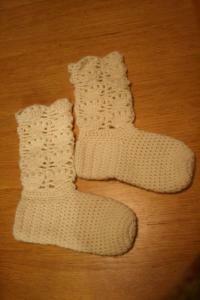 The socks have come in useful as the cold weather has settled in. So many for you Tiffany. You're so welcome Em! 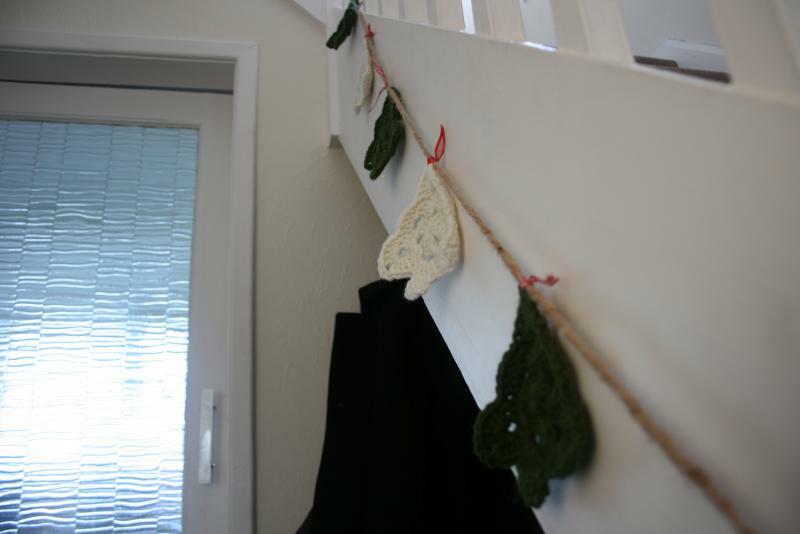 Yes, the garland is on jute twine I'm so glad you liked your package, it was so much fun creating it for you! back!